Flat roofing systems are the most common and prevalent commercial roofing options available today. High quality, modern and durable, they can withstand just about anything, and they come in a variety of different styles. EPDM, thermoplastic, solar and green roofs are among the most popular and stylish roofing systems available today, all of them offering durable, sustainable and energy-efficient choices for you to consider. For increased durability and weather resistance, TPO and EPDM roofing systems are the best. Aside from being highly resilient, these roofs also come in a variety of styles, including many different color options and styles involving roof coating that make them better suited for buildings that need additional fire and weather resistance. 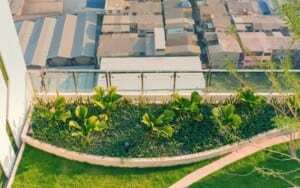 Green roofs are probably the most stylish types of roofing systems available. You can set them up to look like genuine gardens, and they’ll outshine your competitors. As a result, green roofing systems can be used not only as an energy efficient choice, but also as a fashionable roof that looks great from every angle.